Haggis is a traditional Scottish dish. Extremely well known, it is perhaps the one food which most represents Scotland. Traditionally, the haggis is cooked in a sheep's stomach, rather like a very large oval sausage. The haggis was the subject of the Robert Burns' poem, Address To A Haggis, which is recited while the haggis is marched in, accompanied by bagpipes, to be served at a Burns supper. The haggis is an example of human ingenuity in using every part of an animal for food, in a way that preserves the meat without spoiling for later consumption and in a manner that allows transportation. Also, the haggis has become a cultural icon. Its contents and preparation reflect the Scottish trait of thriftiness. Its popularity among expatriates is evidence of pride in their culture, particularly as represented by Robert Burns. Well-known throughout the world as typical Scottish fare, yet rather enigmatic in origin and flavor, the haggis also reflects not only the mystique but also the humor of the Scots, as tourists are often teased and tricked with tales of the fictional Wild Haggis. Haggis somewhat resembles stuffed intestines (pig intestines otherwise known as chitterlings or the kokoretsi of traditional Greek cuisine), sausages, and savory puddings of which it is among the largest types. As the 2001 English edition of the Larousse Gastronomique puts it, "Although its description is not immediately appealing, haggis has an excellent nutty texture and delicious savoury flavour." There are many recipes for haggis, most of which include the following ingredients: sheep's "pluck" (offal) (heart, liver, and lungs), minced with onion, oatmeal, suet, spices, and salt, mixed with stock, and traditionally boiled in the animal's stomach for approximately three hours. Haggis is widely available in supermarkets in Scotland (and in some parts of England) all the year round, with cheaper brands normally packed in artificial casings, rather than stomachs, just as cheaper brands of sausages are no longer stuffed into animal intestines. 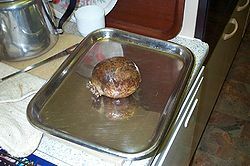 Sometimes haggis is sold in canned, and can simply be microwaved or oven-baked. Some supermarket haggis is largely made from pig, rather than sheep, offal. Since the 1960s various Scottish shops and manufacturers have created vegetarian haggis for those who do not eat meat. These substitute various vegetables and lentils for the meat in the dish, and have proved remarkably popular. Since both the offal-based and the vegetarian haggis have wide variations in flavor depending on the recipe used, it would be difficult to demonstrate that the two varieties do or do not taste alike. The haggis is frequently assumed to be Scottish in origin although there is little evidence for this. It appears that the Ancient Romans made products of the haggis type. A kind of primitive haggis is referred to in Homer's Odyssey, in book 20, when Odysseus is compared to "a man before a great blazing fire turning swiftly this way and that a stomach full of fat and blood, very eager to have it roasted quickly." Clarissa Dickson Wright repudiated the assumption of a Scottish origin for haggis, claiming that it "came to Scotland in a longship [in other words from Scandinavia] even before Scotland was a single nation." Dickson-Wright further cites etymologist Walter William Skeat as further suggestion of possible Scandinavian origins: Skeat claimed that the hag– part of the word is derived from the Old Norse hoggva or the Icelandic haggw, meaning 'to hew' or strike with a sharp weapon, relating to the chopped-up contents of the dish. 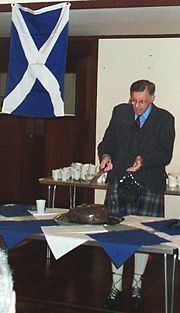 Dickson Wright suggests that haggis was invented as a way of cooking quick-spoiling offal near the site of a hunt, without the need to carry along an additional cooking vessel. The liver and kidneys could be grilled directly over a fire, but this treatment was unsuitable for the stomach, intestines, or lungs. Chopping up the lungs and stuffing the stomach with them and whatever fillers might have been on hand, then boiling the assembly—likely in a vessel made from the animal's hide—was one way to make sure these parts did not go to waste. In fact, in times of famine people would eat whatever it was that they could get their hands on, which is how all those fascinating ingredients became a part of Scottish tradition. Popular folklore has provided more additional theories regarding the origins of the haggis. One such belief is that the dish originates from the days of the old Scottish cattle drovers. When the men left the highlands to drive their cattle to market in Edinburgh the women would prepare rations for them to eat during the long journey down through the glens. They used the ingredients that were most readily available in their homes and conveniently packaged them in a sheep's stomach allowing for easy transportation during the journey. Other speculations have been based on Scottish slaughtering practices. When a Chieftain or Laird required an animal to be slaughtered for meat (whether sheep or cattle) the workmen were allowed to keep the offal as their share. Haggis, with "neeps an tatties"
Haggis is traditionally served with "neeps and tatties" (Scots: swede, yellow turnip or rutabaga and potatoes; these are boiled and mashed separately) and a "dram" (a glass of Scotch whisky). However, it might perhaps be more accurate to describe this as the traditional main course of a Burns supper, since on other occasions haggis may be eaten with other accompaniments. Whisky sauce (made from thickened stock and Scotch whisky) has also been developed as an elegant addition. Haggis can be served in Scottish fast-food establishments deep fried in batter. Together with chips, this comprises a "haggis supper." A "haggis burger" is a patty of fried haggis served on a bun, and a "haggis bhaji" is another deep fried variant, available in some Indian restaurants in Glasgow. Higher class restaurants sometimes serve chicken breast stuffed with haggis which is often referred to as "Chicken Jacobite"; haggis can also be used as a substitute for minced beef in various recipes. Another modern haggis-based dish is "Flying Scotsman," chicken stuffed with haggis. This dish is also known as Balmoral Chicken when the chicken is stuffed with haggis and also wrapped in bacon. Recitation of the poem Address to a Haggis by Robert Burns is an important part of the Burns supper. Scotch whisky is often asserted to be the traditional accompaniment for haggis, though this may simply be because both are traditionally served at a Burns supper. Warren Edwardes of Wine for Spice notes that haggis is spicy and therefore recommends refreshing semi-sparkling wines to drink with haggis with increasing level of sweetness depending on the spiciness of the haggis. He argued that whisky, on the other hand, with its high alcohol level, can exaggerate spice rather than complement it. Haggis-maker MacSween conducted a taste-test, confirming that whisky is a proper accompaniment for haggis, adding that lighter-bodied, tannic red wines, such as those made from the Barbera grape, are also suitable, as are strong, powerfully flavored Belgian beers, such as Duvel and Chimay Blue. Haggis is popular with expatriate American Scots due to the strong connotations it has with Scottish culture. It is particularly popular for celebrations of St. Andrew's Day (November 30) and Burns suppers in January. In summer, the "off-season" for haggis, it is a popular dish at Scottish and Celtic festivals. However, the import of haggis to the USA was deemed illegal, in a measure that dates back to the Mad-cow disease scare of 1989. This is due to the offal ingredients, such as sheep lungs, found in haggis. 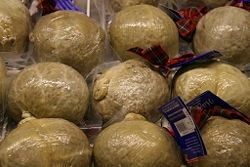 The British Food Standards Agency disputed these concerns, and claimed there is no reason for the import of haggis to be restricted. As a result of the ban on imported haggis, several American manufacturers have developed their own recipes, which have become popular. Haggis is traditionally served with the Burns supper on the week of January 25, when Scotland's national poet, Robert Burns, is commemorated. He wrote the poem Ode Tae a Haggis, which begins "Fair fa' your honest, sonsie face, Great chieftain o' the puddin-race!" During Burns's lifetime haggis was a popular dish for the poor, as it was very cheap being made from leftover, otherwise thrown away, parts of a sheep (the most common livestock in Scotland), yet nourishing. The traditional Burns supper always includes haggis as the main dish. Whether the whole event is formal or not, everyone stands as the haggis is brought in by the cook, generally accompanied by a piper playing bagpipes. The host then recites the Address To a Haggis. This custom has been carried through the years and is firmly established as one of the key recitals at any Burns Supper, celebrated by millions throughout the world. Haggis, along with some other foods associated with a specific country or region (such as Australia's Vegemite, Minnesota's lutefisk, or Scandinavia's salmiakki), is perceived to be loved in its home country and loathed by the rest of the world. The Scots often enjoy exploiting the unusual aspects of haggis to visitors who are curious, albeit with expectations of disgust, about this famous yet rather mysterious dish. Tourists are often fooled (at least briefly) by Scottish pranksters attempting to lead them on a 'Wild Haggis Hunt'. Furthering this joke, The Scotsman newspaper's web site runs an annual Haggis Hunt. Haggis is also used in a sport called haggis hurling, throwing a haggis as far as possible. The Guinness World Record for Haggis Hurling was held by Alan Pettigrew for over 22 years. He threw a 1.5 lb Haggis an astonishing 180 feet, ten inches on the island of Inchmurrin, Loch Lomond, in August 1984. 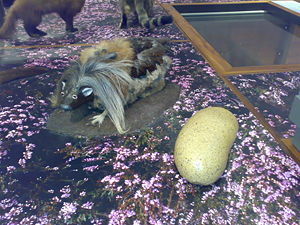 A fictional Wild Haggis specimen, Haggis scoticus, as displayed in the Glasgow Kelvingrove gallery, next to a prepared example. Wild Haggis (Haggis scoticus) is a fictional creature said to be native to the Scottish Highlands. 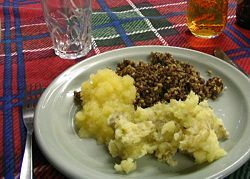 It is comically claimed to be the source of the traditional haggis dish. According to some sources, the left legs of the wild haggis are of different length than its right legs, allowing it to run quickly around the steep mountains and hillsides which make up its natural habitat, but only in one direction. It is further claimed that there are two varieties of haggis, one with longer left legs and the other with longer right legs. The former variety can run clockwise around a mountain (as seen from above) while the latter can run anticlockwise. The two varieties coexist peacefully but are unable to interbreed in the wild because in order for the male of one variety to mate with a female of the other, he must turn to face in the same direction as his intended mate, causing him to lose his balance before he can mount her. As a result of this difficulty, differences in leg length among the Haggis population are accentuated. The notion of the wild Haggis is widely believed, though not always including the idea of mismatched legs. According to a survey released on 26 November 2003, one-third of U.S. visitors to Scotland believed the wild Haggis to be a real creature. Chireta is an Aragonese type of haggis. It is a flavorful rustic dish in the counties of Ribagorza, Sobrarbe, and Somontano de Barbastro, high up in the Spanish Pyrenees. In the Catalan counties of Alta Ribagorça and Pallars, chireta is known as gireta, or girella, respectively. Being a mountain recipe, nothing goes to waste: once the choice cuts of a slaughtered sheep have been reserved, the Chireta is made by boiling a mixture of rice and sheep offal, mainly lungs and heart, inside the sheep intestines. The mixture is enhanced with rice, chopped pancetta or bacon, cured ham, parsley, garlic, a pinch of cinnamon, salt and white pepper. Chireta literally means "Inside Out"—the sheep's intestines which make up the casings are cleaned and turned inside out for a smoother, more appetizing appearance. Drob is a Romanian dish, similar to haggis, traditionally served as the main dish at Easter. It is a cooked mix of spiced minced lamb organs (liver, heart, and lungs) together with green onions and eggs, cooked in the lamb's stomach. Saumagen is a German dish popular in the Palatinate. The name means "sow's stomach," but the stomach is seldom eaten, rather it is used like a casing. Saumagen consists of potatoes, carrots and pork, usually spiced with onions, marjoram, nutmeg white pepper, and various recipes also include other herbs or spices. Sometimes beef is used as well. The larger ingredients are diced finely. After that, the saumagen is cooked in hot water and either served directly with sauerkraut and mashed potatoes or stored in the refrigerator for later use. Slátur (meaning ("slaughter") is an Icelandic dish in which sheep's stomachs are filled with blood, fat, and liver. The idea is to use everything from the slaughtered sheep and not let any food go to waste. Many Icelandic housewifes used to make one or two types of slátur each autumn with the participation of the whole family. In contemporary times they generally buy slátur in the supermarket. ↑ Joël Robuchon and Prosper Montagne, Larousse Gastronomique (New York, NY: Clarkson Potter, 2001, ISBN 978-0609609712). ↑ Robert Burns would have Scoffed at Vegetarian Haggis World Hum (2008). Retrieved May 27, 2008. ↑ Alan Davidson, The Oxford Companion to Food (UK: Oxford University Press, 2006, ISBN0192806815). ↑ Andrea Barham, The Pedant's Revolt: Why Most Things You Think Are Right Are Wrong (Michael O'Mara Books Ltd., 2005, ISBN 1843171325). ↑ Clarissa Dickson Wright, The Haggis: A Little History (Pelican Publishing Company, 1998, ISBN 1565543645). ↑ Sarah Pickering's menu Come Dine With Me - Series 3, Channel4.com (2008). Retrieved May 27, 2008. ↑ Balmoral Chicken with Clapshot and Creamy WHisky Sauce Scotland on TV. Retrieved May 27, 2008. ↑ Warren Edwardes, Wine With Haggis Wine for Spice. Retrieved May 27, 2008. ↑ Drinks with Haggis Retrieved May 27, 2008. ↑ Scots ask US to lift haggis ban BBC News (2008). Retrieved May 27, 2008. ↑ Brett Martin, Haggis, Updated: Less Offal, Tastes Great The New York Times (2007). Retrieved May 27, 2008. ↑ Haggis Hunt scotsman.com. Retrieved May 27, 2008. ↑ "HURLING THE HAGGIS" Haggis Hurling Association. Retrieved June 24, 2008. ↑ Wild Haggis Feature Page on Undiscovered Scotland Retrieved June 24, 2008. ↑ US tourists believe haggis is an animal | UK news | The Guardian Retrieved June 24, 2008. ↑ Mihaela Lica, Traditional Easter Food in Romania Romania Simply Surprising. Retrieved May 27, 2008. ↑ James Martin, Picture of Saumagen, a typical food of the Palatinate region. Retrieved May 27, 2008. ↑ Slátur - Slaughter - a traditional Icelandic dish, Facts about Iceland - for the independent traveller. (2007). Retrieved May 27, 2008. All links retrieved July 24, 2017. This page was last modified on 24 July 2017, at 19:31.